The interesting name reveals the interesting snack recipe. It is actually double slices of bread rings dipped in dal batter, hence the double decker and then ofcourse air fried to maintain the health value. 1. Make a smooth batter of Moong dal flour and water. Add all spices. Mix well. 2. Cut round pcs of 2 bread slices and in another 2 slices, make rings. 3. 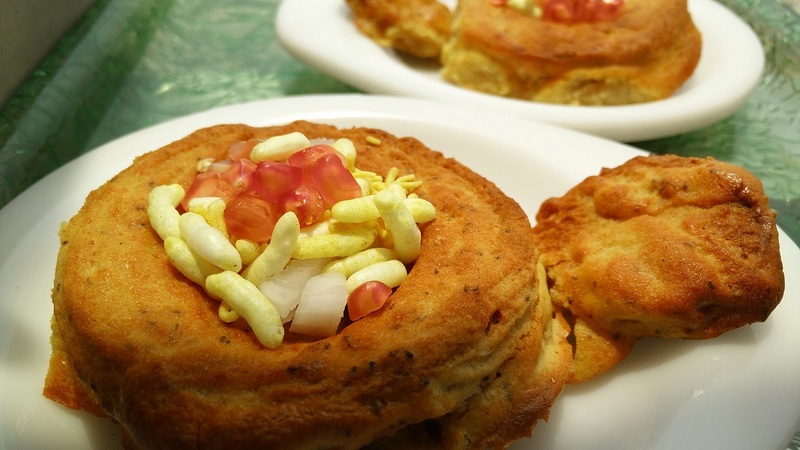 Dip these bread slices in the dal batter and place the ring bread slices on top of round bread slice such that a hole is formed in the centre. This forms the double decker of the bread slices. 4. Place these pcs on a foil paper and smear little oil on top for greasing. Put it a preheated air fryer for 15 min at 180 degrees. 5. Take the pcs out from the fryer and allow these to cool a little. In the centre hole, garnish by putting all onions, pomegranate seeds and any namkeen of your choice. Serve with chutney. Thanks for share Philips Airfryer Recipe: Dal Double Decker/ Moong Dal Bread Pakora. This fryer is always ideally simple to use too; it does not need pre-heating like an stove and it has a clock. It's also simple to fresh up after use as its sink, stirrer and lid can securely be jumped into the dish washer.